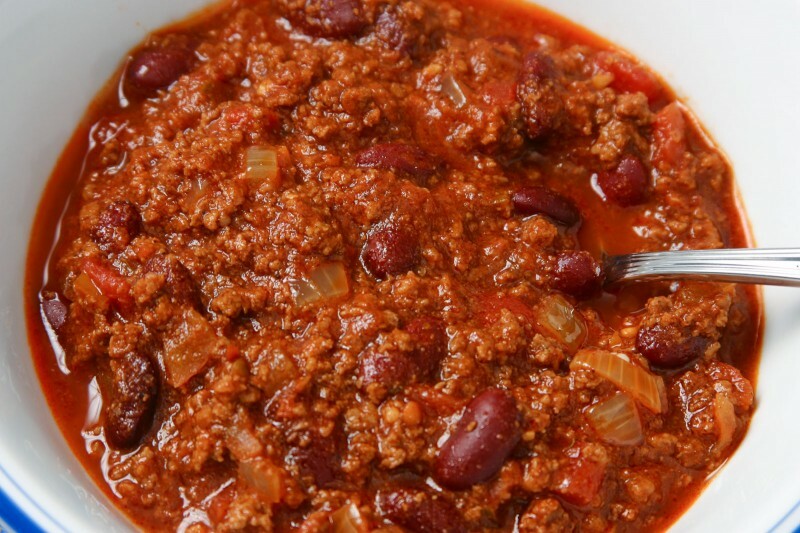 We tried out this chili recipe over the winter and I have been meaning to get it up here. It is not that it was badâ€“the chili came out greatâ€“I am just lazy. This chili is not to spicy but has just enough kick. 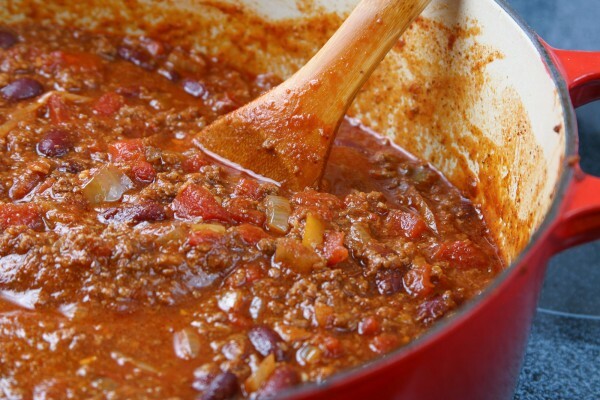 There are a lot of ingredients that go into this chili, which helps give it a lot of depth. One of the most important parts of the chili is the condiments. Try some shredded cheese, chopped cilantro, diced tomatoes, sliced jalapeÃ±os and, of course, Fritos! Heat the oil in a large Dutch oven, over medium heat, until the oil is shimmering but not smoking, roughly 3 to 4 minutes. 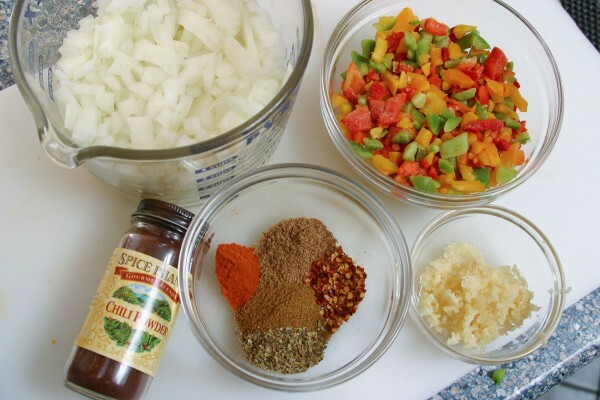 Add the onions, bell pepper, garlic, chili powder, cumin, coriander, pepper flakes, oregano, and cayenne. 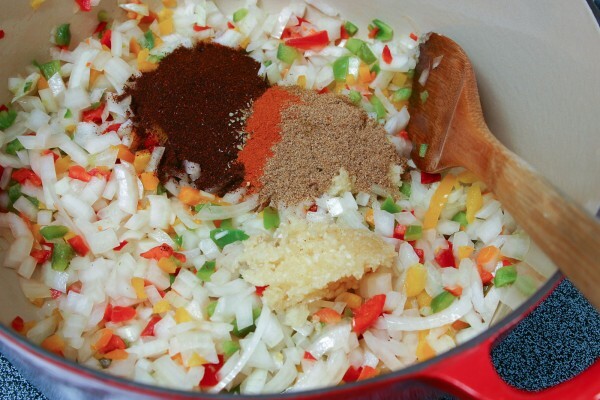 Cook the mixture, stirring occasionally, until the vegetables are softened and beginning to brown, about 10 minutes. Increase the heat to medium-high and add half the beef. Cook, breaking up the pieces with a wooden spoon, until no longer pink and just beginning to brown, roughly 3 to 4 minutes. Add the remaining beef and cook, breaking up the pieces with a wooden spoon, until no longer pink, 3 to 4 minutes. Add beans, tomatoes, tomato puree, and a 1/2 teaspoon salt; bring to boil, then reduce the heat to low and simmer, covered, stirring occasionally, for 1 hour. Remove the cover and then continue to simmer for 1 hour longer, stirring occasionally (if chili begins to stick to bottom of pot, stir in 1/2 cup water and continue to simmer), until the beef is tender and the chili is dark, rich, and slightly thickened. Adjust the seasoning with additional salt. Serve with lime wedges and condiments if desired. At the end of step 1, transfer the cooked beef mixture to a slow cooker; add the rest of the ingredients as directed in step 2. Cook the chili on the high setting for four hours. Thanks !! Delicious! I put it over baked potatoe with sour cream. Great dinner with a side of salad. Actually, it it right out of Cook’s Illustrated magazine, the same people who produce America’s Test Kitchen… as noted at the top of the recipe. This recipe was fantastic! I love chili, and this prepared low and slow over 5 hours was delicious! Poured over spaghetti noodles and fresh grated cheddar cheese and a side of honey corn bread, EXCELLENT! Thank you! I’ve got this recipe heating up in the slow cooker right now. I added some bacon and celery, and used one more can of beans. It tastes great, can’t wait to dig in! Thanks for the recipe. I may just post it on my own blog! Thanks for sharing the recipe. My daughter asked me to cook this for dinner..btw what do we normally eat with this? Great to hear! We always like having corn bread with it. Yuck – chili made with hamburger and cans of beans and tomatoes. Open a can of Stagg’s – it’s just as awful and faster. Such an authority on good and bad chili… you don’t like beans or canned tomatoes, so you want everyone to know? Congratulations. yum! this looks easy and fabulous! Thanks for sharing!